Bachor, Claus. 1995. „Detroit.“ In Techno, ed. Phillipp Anz and Patrick Walder, 79-83. Zürich: Verlag Ricco Bilger. Chan, Seb. 1999. “Bubbling Acid: Sydney‘s Techno Underground.” In Australian Youth Subcultures: On the M and in the Mainstream, edited by Rob White. Hobart: ACYS Publications, 65-73. Collins, Karen. 2005. “Dead Channel Surfing: The commonalities between cyberpunk literature and industrial music” Popular Music 24(2), 165-178. Coultas, Jimmy and Alun Johsnon. “Underground Resistance”. Plasticsoup.com. Hitzler, Ronald & Pfadenhauer, Michaela. 2002. “Existential Strategies: The Making of Community and Politics the Techno/Rave Scene.” In Postmodern Existential Sociology, edited by Joseph Kotarba and John Johnson. 87-101. Lipsitz, George. 2007. “”Techno: The Hidden History of Automation”.” In Footsteps In The Dark: The Hidden Histories of Popular Music, edited by None. Minneapolis: Univ of Minnesota Press, 238-62. May, Beverly. 2006. 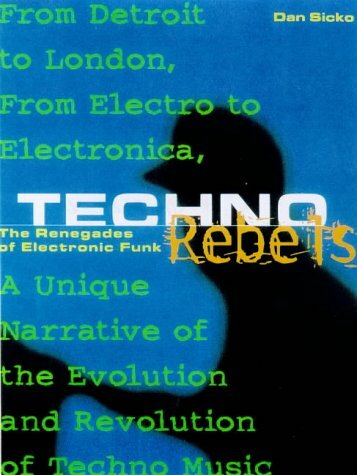 “Techno.” In African American Music: An Introduction, ed. Mellonee V. Burnim and Portia K. Maultsky, 331-352. New York, London: Routledge. Tausig, Ben. “Detroit Techno: Race, Agency, and Electronic Music in Post-Industrial Detroit.” Masters, University of Michigan, 2003. Ueno, Toshiya. 2003. “Unlearning to Raver: Techno-Party as Contact Zone in Trans-Local Formations.” In The Subcultures Reader, edited by David Muggleton and Rupert Weinzierl. Oxford: Berg, 101-117. Vecchiola, Carla. 2006. “Detroit’s rhythmic resistance: Electronic music and community pride”. Ph.D. Disserta (American Studies), University of Michigan. Vitos, Botond. “Translocal connections and local simulations of techno” in: Giuffre, Liz and Spirou, Penny (eds.) Routes, Roots and Routines: Selected papers from the 2011 Australia/New Zealand IASPM Conference. Sydney, N.S.W. : International Association for the Study of Popular Music Australia New Zealand Branch, 2012: 25-33. Bredow, Gary. 2006. High Tech Soul. USA: Plexi.